Over the years Anerley B.C. 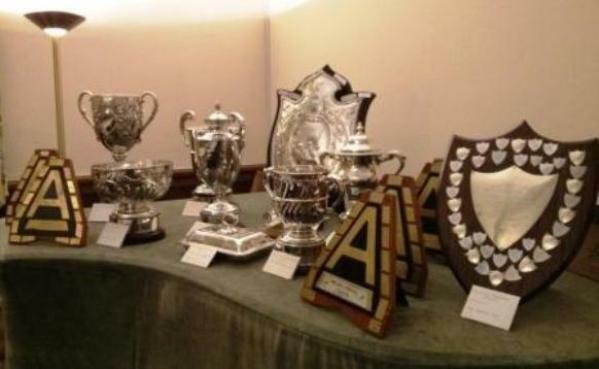 has amassed a fine collection of silverware, making the Club’s annual dinner and prize giving well worth the ticket price. Well it is if you manage to win one of these superb cups and shields! And just look at the array of trophies to be won each year by our enthusiastic members. Of course these trophies are not just given away, but have to be earned. And now is the time that you have to put in the hard graft and effort in order to have your name engraved, to identify you as a worthy winner at next year’s prize giving. However it might be of interest to you, to learn a bit about the history behind some of these magnificent and valuable works of art. The most valuable of the Anerley trophies was the Carwardine Cup which was awarded to the winner of a 100 mile race held annually at Herne Hill cycle track.. 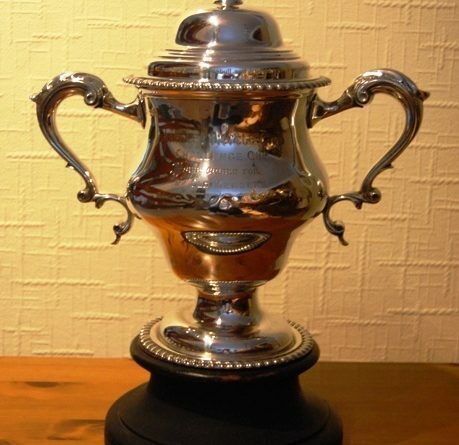 The cup was donated to our club in 1895 by a Vice President whose name was surprisingly – Carwardine! It was not just a cup but a huge cup, valued at the enormous sum for those days, of 300 guineas. And huge it was, standing 4 foot 10 inches tall, and made from 650 ozs of silver, with ornamentation of solid gold. The tradition in those far off days was that if a person won a trophy three times they could keep it in perpetuity. Unfortunately for Anerley B.C, the trophy was won by a crack racer from the Bath Road Club in 1896, and for the third time in 1900. So Anerley B.C. had to say goodbye to its Carwardine Cup, and hence no photo to show you! 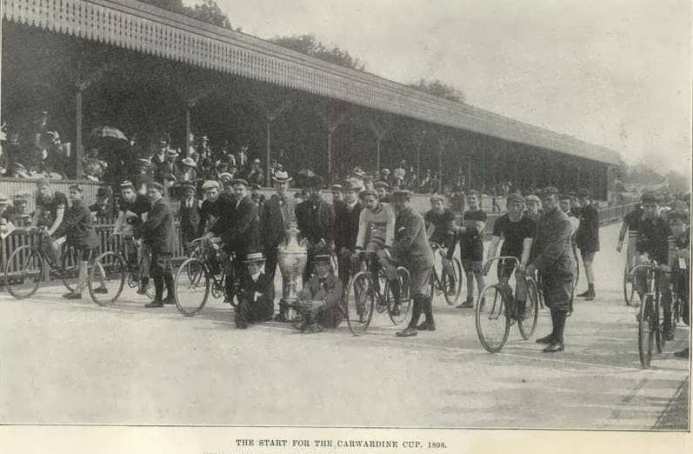 However I do have a photo to show you of the start of the Cawardine Cup Race held at Crystal Palace in 1899, the year before we lost the cup for ever. But win some, lose some, this loss was to some extent countered by an Anerley man winning another magnificent trophy, the Appletree Shield. 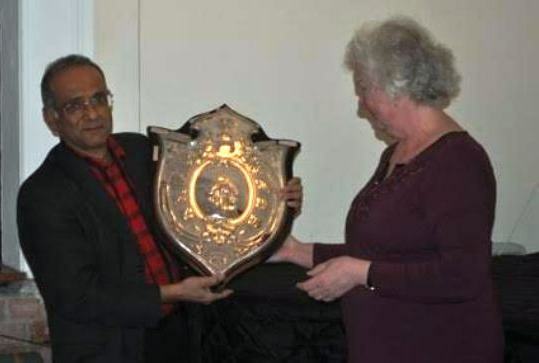 The Appletree Shield was donated to the Vegetarian Cycle Club by the owner of the Appletree Vegetarian Restaurant, hence its name. The shield was awarded by the Veggie C.C at an annual event to the rider who covered the greatest distance on a road course, in 12 hours. 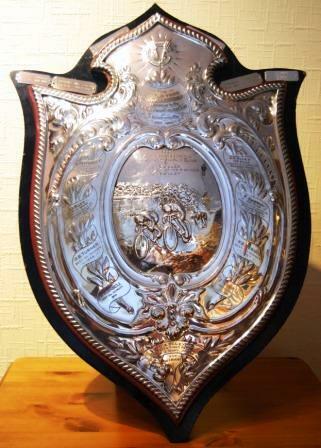 In the following years, 1901, 1902, and 1904 the shield was awarded to G.A. 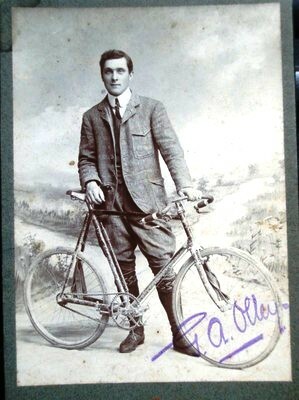 Olley of the Anerley Bicycle Club, one of the most outstanding distance cyclists of his era. His record ride in 1904 was over a distance of 202 miles, which over unmade roads (no tarmac then, just muddy cart tracks!) was a great achievement. It was also an achievement to win this gruelling event three times, as a result of which the shield was given to him to keep, in perpetuity. Perhaps an interesting little snippet, is that Olley was himself a vegetarian. So he was a very apt and worthy winner of this trophy. A more interesting snippet is the second item, see below. 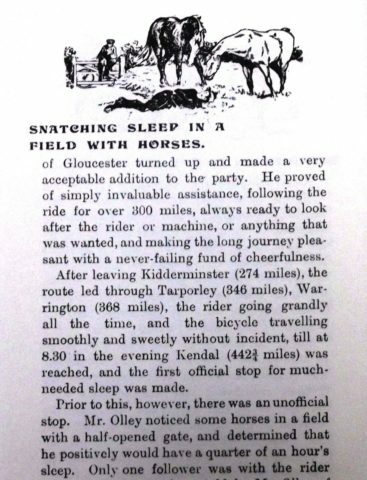 This appeared in a sporting almanac which listed cycling records in the year 1902. “To replace the lost cup Mr Carwardine gave a smaller, but gold one. For the first and second race for this in 1901 – 1902 our G.A. Olley proved the winner, and in 1902 we also provided the second man , F.A.Daymond, who had been third the year before. The final, amusing comment, was a reflection of how dominant G.A. was, being one of the greatest long distance cyclist of his times.This dominance continued over several years. For example in 1907 he set the record for 1,000 miles, completed in 4 days 9hr 3mins. But this record is not what he is best remembered for. So read on! G.A’s most famous achievements were setting the record for the Lands End to John O’Groats ride, twice. First in 1903 and then reducing his first record by 15 hours in 1905 with a remarkable time of 3 days, 5 hrs and 20 minutes! The photo above, and signed by him, appears in a very interesting booklet produced by the New Hudson Cycle Co. They supplied his bikes and were quick to capitalise on Olley’s achievement by adding a replica J.O.G model to their range of bicycles. The booklet, whilst being promotional material for the new J.O.G model bike, is a fascinating record of how such record breaking rides were organised and conducted. This booklet is entitled ” Souvenir of Olley’s Great Ride” and details how his record breaking ride started at the Land’s End Hotel on Tuesday 18 July 1905, at 8.00 am. The plan was for him to ride for 36 hours without sleep, and to quote ” Small wonder then, that about 2 o’ clock on Wednesday morning the rider began to feel almost unconquerably drowsy.” At this point Olley’s front tyre punctures and he has to wait for 15 minutes until a replacement bike arrives. Then, ignoring his tiredness, he sets off again and is 13 minutes behind schedule when he arrives at Gloucester on Wednesday morning, 19 hours and 5 minutes after leaving Land’s End. On and on he continues, Kidderminster at 274 miles, Warrington 368 miles, “until at 8.30 in the evening Kendal (442 3/4 miles) was reached, and the first official stop for much needed sleep was made”. However, prior to this, the exhausted Olley had managed to sneak in a 15 minute cat nap in a field of horses! See below. But to return to the Appletree Shield, which G.A won three times and so kept it in perpetuity. In 1955, upon the death of G.A. Olley, his son donated the shield to Anerley B.C. and it is now one of our most prized and coveted trophies. Naturally with its provenance, the shield should continue to be awarded for some deed of cycling endurance. Fortunately the present day Anerley club member does not have to ride to John O’Groats and back in less than 3 days to be awarded the Appletree Shield. The shield is now awarded to the Club member who has completed the greatest cycling challenge during the year. At the last annual prize giving it was unanimously agreed that our new Club Captain, Tom Vaz should be the worthy winner for the 2015 season. His achievement was to ride solo, over the Alps to Rome, spending most nights (cheap skate that he is) sleeping in a hammock strung up between a couple of trees! Tom’s economy class overnight accommodation! And St. Peter’s Basilica – Rome, at last after 25 days and 1284 miles! 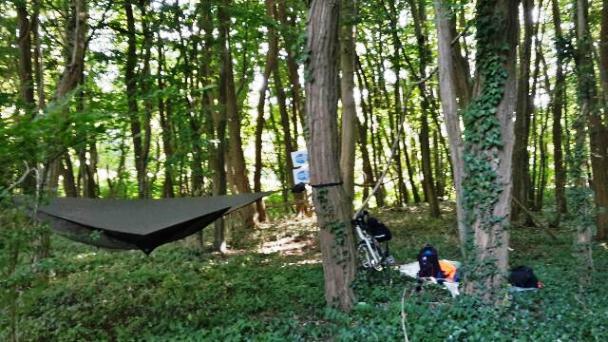 By my reckoning, G.A would have completed the 1284 miles in a little over 5 days 12hrs and 15 minutes, but then he would not have had to carry a hammock! Well done Tom, with the money that you saved on accommodation, I think it is tea all round for at least the next four Sunday Rides! 1. 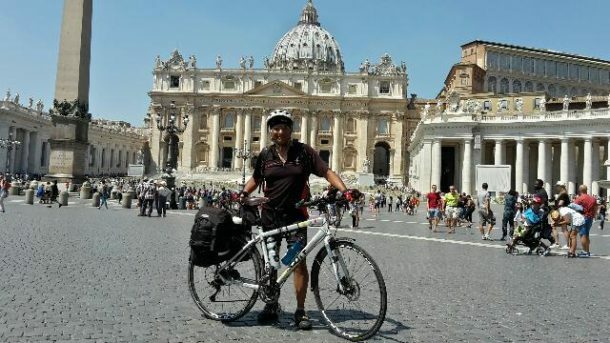 Tom’s ride to Rome was for the purpose of raising money for the South East Cancer Help Centre. His epic journey is detailed in 3 parts (cos it was a very long ride!) at / http://the-picos-ride-for-cancer.blogspot.co.uk/ – just follow the links for the complete story. However this was not his first, but his third such charity bike ride for the S.E.C.H.C. The first was back in 2010 when Tom and I took his then, 14 yr old son Luke, on a money raising adventure into the Picos de Europa Mountains in Spain and hence his blog’s title of The Picos Ride For Cancer. So Club Captain Tom is a bit of an old hand at long distance rides in mountainous terrain! 2. When the powers that be are considering to whom to award the various club trophies, they are guided to a great extent by reports/write ups on the club web site. How else will they know the details from which to make their decisions? So it is very important that the more important, or interesting events are recorded, preferably with photos to become part of the ongoing history of Anerley B.C. – no photo of trophy unfortunately as it is quite an impressive piece of silverware. You should contact them to get a photo to update your history page! As a result of the above I did contact with Winchester Council, but not being used to record breaking, I am still awaiting a reply!